I was in Yangon, Myanmar (formerly known as Burma under British colonial rule) along with my niece Rashmita and nephew Rupankar. Myanmar is situated in the north-east section of Asia. After decades of self-imposed isolation from the rest of the world under the dictatorship of its military rulers, the country just opened its border to the outsiders. Currently, the country has been experimenting with democracy under the leadership of Nobel Laureate Ms. Aung San Suu Kyi. While researching the county, we learned about a magnificent golden temple of prayer of Buddhism in Yangon, the historic capital of the country. Flying out of Calcutta, India, we arrived in Yangon in a late afternoon. By the time we reached our hotel, darkness already descended. 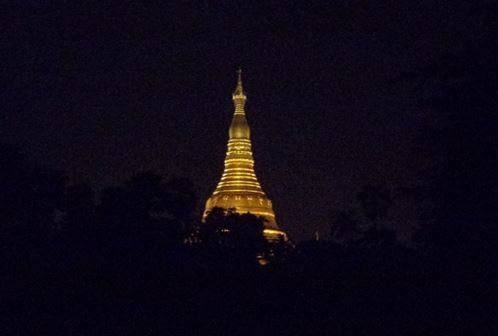 Looking outside through hotel-windows, the first glimpse of the golden temple, known locally as the Shwedagon Pagoda, illuminated in light, came to our view. 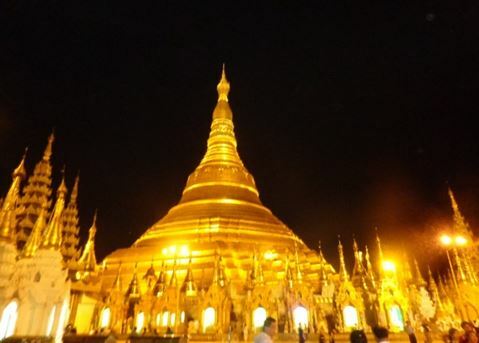 Next day after exploring the city’s various landmarks throughout the day, we set out to explore the pagoda in the evening. As we approached, the enormity of the temple-complex, glittering in light became apparent. We entered the temple complex through one of the designated gates, guarded by two mythological animal sculptures. Once inside the complex, a feeling of being transported suddenly to a magical wonderland engulfed us. The entire complex was populated not only by the local devotees, but also by the visitors from overseas. We learned that the base of the pagoda is made up of genuine gold bricks. Just above the base, there are the gold-plated terraces (accessible only to the monks). Next up is the bell-shaped section of the pagoda, on top of which were built in succession sections called the turban, inverted alms bowl, inverted but upright lotus petals and the banana bud. The final piece at the top is an umbrella crown, decorated with more than 5000 pieces of diamond and more than 2000 pieces of ruby, tipped with a large diamond, estimated to be 15 g in weight. The main pagoda was surrounded by several smaller pagodas on the perimeter of the complex. 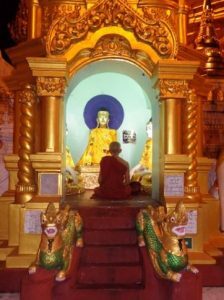 While circling around the main temple with the devotees, we observed monks to be in meditative prayers inside those decorative smaller temples. There are various donated treasures (by past kings of the country) spread throughout many temples. In addition, the religious historic sculptures adorned many walls. As the evening grew into night, we left the pagoda complex, being in awe to its magical magnificence along with its spiritual atmosphere. All photographs by Rupankar Chatterjee.